Business Education - Is This The End For The Department? 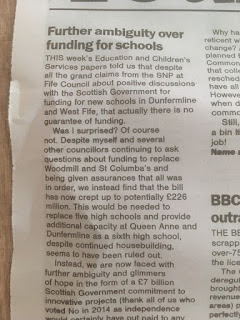 Earlier this year I wrote about my concerns following cuts to high school budgets in Fife by the SNP-Labour Administration at the Council. 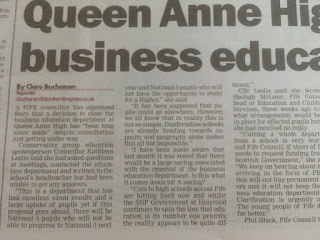 Of particular concern was the future of the Business Education Department at Queen Anne High School in Dunfermline. I was made aware of a plan that would see the future of the department under threat of closure. Following the Summer break and the beginning of the Autumn term the question came up again. Despite writing to the Education & Children's Services Directorate (most recently waiting over 3 weeks for a reply) I have still received no assurance that this vital department will remain open. Indeed, the possibility of closure appears to be quite definite judging by the evasive responses I have had. Two weeks ago I brought the matter to the attention of the local media again and following on from that I was contacted by a member of the Scottish Youth Parliament who has now set up a petition. At this stage I would absolutely urge any concerned parent or affected pupil to contact both the school and the Education Directorate and seek an assurance that the department will remain open. 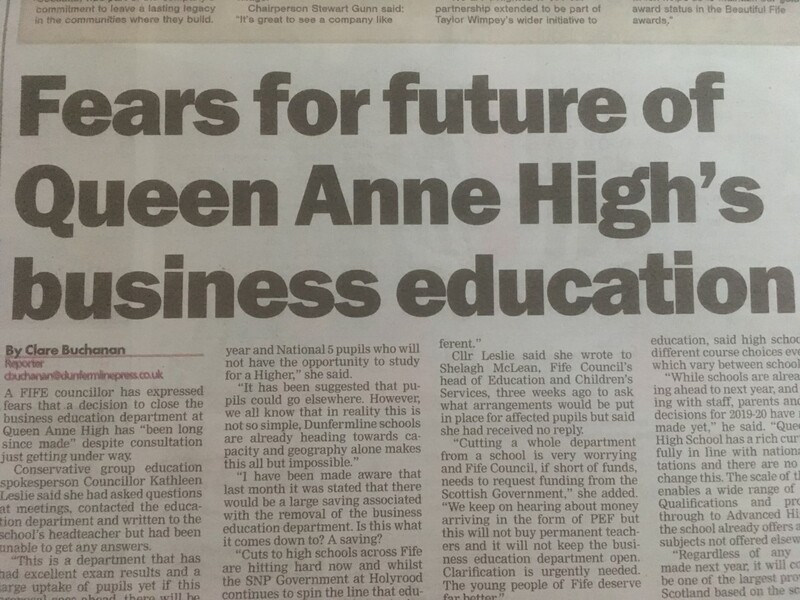 Last week I once again raised concerns about the future of the Business Education Department at QAHS (DP 8/11/18). Having finally received a belated reply from Head of Education & Children’s Services, Shelagh McLean it appears there is still no clarification. 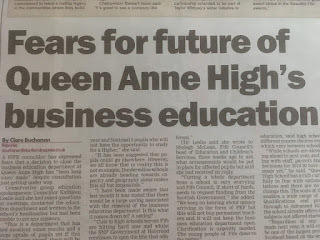 I note that Phil Black has commented that “Queen Anne has a rich curriculum, fully in line with national expectations and there are no plans to change that.” By that I would then presume he must mean the Business Education Department will continue to run during the next academic year then? 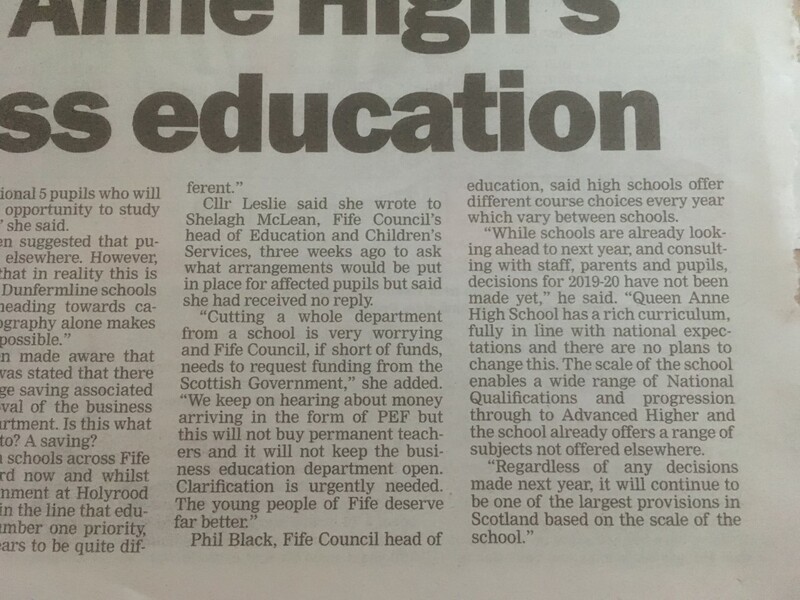 The department, I have been informed, has a cohort of nearly 30 National 5 pupils who should have the opportunity to return and study Administration Financial Services or Business Management. 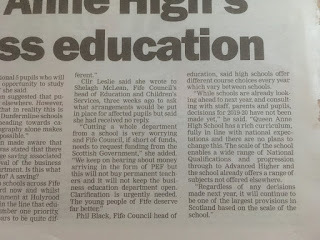 It also has National 4 pupils who may choose to work towards National 5 next year and of course, a Higher class who would also have the opportunity to progress to Advanced Higher – which would be of specific importance for some university entrance requirements. Therefore, to continue with this “rich curriculum” surely that must mean the opportunity for pupils to continue to study throughout the senior phase subjects within the Business Education Department? I would urge any concerned parents and affected pupils to ask for clarification that this vital subject will continue to run. 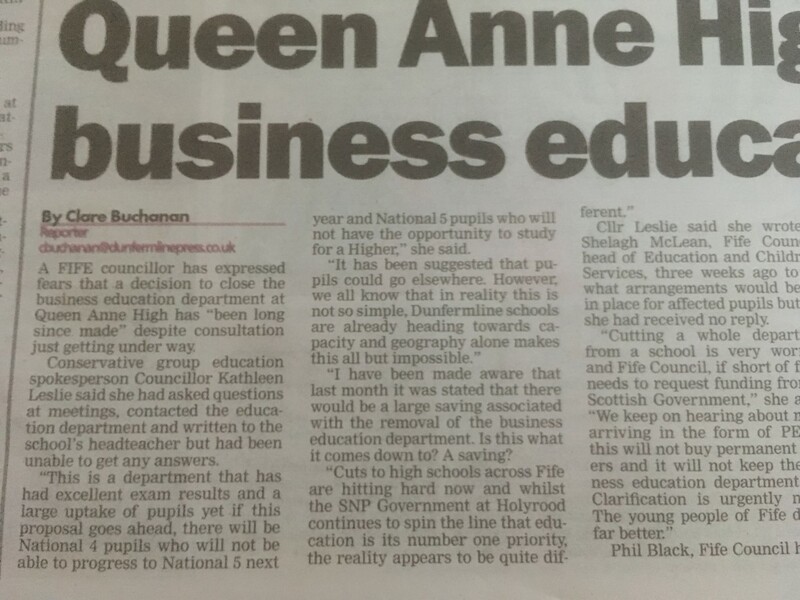 Mr Black states that “the school already offers a range of subjects not offered elsewhere”, if Business Education is to cease, Queen Anne High School will be the only high school in Fife not to run this range of subjects. "Teachers in Scotland are currently operating within a system of severe micro-management, where everything that occurs does so under an umbrella of ‘super’vision." 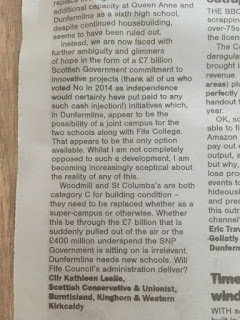 I couldn't agree more - whether it be Regional Improvement Collaboratives (going ahead despite a shelved Education Bill) or SNSA testing of P1 (its apparently not statutory but local authorities are expected to carry them out) there is culture of micro-management and despite claims of empowering schools the opposite is happening. The Scottish Government decides and local authorities are expected to do as they are told and no-one is to question. Tomorrow the Education & Children's Services Committee meets in Fife, on the agenda is SNSA in P1 - councillors are asked to "note the report". Thats it - note it and swiftly move on. This is despite all parties, with of course the exception of the SNP who carry out the bidding of their government at Holyrood, voting to call a halt to these tests. 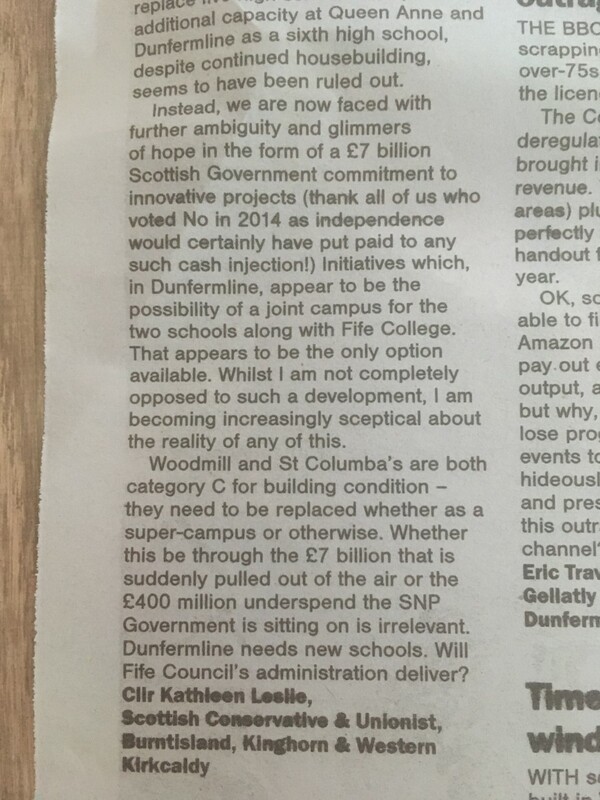 We are also asked to agree for Fife to move onto Phase 2 of the Regional Improvement Collaborative which is going to empower school and teachers (but in fact is another top-down initiative from the SNP Government) - a Collaborative that was part of the now shelved Education Bill - but continue we must. I would suggest a read of the text below. Rod Grant is able to speak out - many educational professionals no longer feel able to about their concerns - most recently seen by an anonymous letter from a teacher to the Education Secretary. Teachers in Scotland are currently operating within a system of severe micro-management, where everything that occurs does so under an umbrella of ‘super’vision. I have often argued that environment and culture is everything in a school. If you get the climate for learning and teaching wrong, everything falls apart. That seems to be what is now happening in Scotland. First, teachers work in a system which does not allow them to utter any public criticism. A teacher’s first loyalty is to their local authority and each is expected to toe the party line. In such a system, there is little opportunity for individuals to create cultures of change or to improvise on methodology or approach. We end up with a system that has a one-size-fits-all mentality. Secondly, there is little attraction to senior leadership posts amongst classroom teachers. You may find this hard to believe but there are currently 15 secondary schools ‘sharing’ head teachers in Scotland and an astonishing 390 primary schools doing likewise, despite the fact that there are currently 412 teachers with Headship qualifications who have chosen to do something else. As recently as last month, there were 92 head teacher or depute posts being advertised in Scotland. But then who would want the top job when the successful candidate (if there were any) has to operate in a climate of mistrust, where there is an intense scrutiny of data on assessment and programmes of learning? That’s not leadership, that’s management on behalf of big brother. Thirdly, an indication that all is not well is something that is occurring now that I have never seen in my 30 years in schools. Teachers are writing ‘anonymous’ letters to the First Minister or posting criticisms on websites set up to give teachers their voice. The word anonymous says it all really. I can put my name to all criticism because I work outside the confines of what has become a political arena. Politics should play no part in our children’s education but it does and it does so on a daily basis. We have letters describing the frustrations of bureaucracy, of the pressure to conform and today a letter which states that the teacher has been compelled to change reporting comments or grades in order to make the school’s results look more positive. That is nothing short of farcical. And now, as a result of years of mismanagement and interference, we have the very real prospect of industrial action. And, let’s be clear, the situation in Scotland could be so very different. We could give teachers the respect they deserve by making their roles more autonomous. The Scottish Government is very good at saying they trust teachers’ professional judgement and then seem to do everything they can to disempower teachers’ professional judgement; standardised tests in Primary 1 the most recent example. We need to develop a true culture of trust where teachers are empowered to deliver the curriculum in the way that their professional judgement leads them. We need the focus to shift away from lesson observation, from constant and overpowering appraisal and from the requirement of reams of written data on assessment. I’ve heard so much utter nonsense about how everyone in power is seeking to tackle bureaucracy, whilst at the very same time requiring more data and more analysis of data so that it can work out what is going wrong. What is going wrong is chiefly to do with real-terms cuts in education budgets, the resultant lack of support and auxiliary staff, an over-reliance on teachers’ goodwill; an environment of mistrust operating in a culture of silence. Apart from anything, Scotland’s children deserve better. And the children would be better served by teachers who are properly resourced and who are allowed to get on with the job in hand without extreme external interference. However, hope reigns. At the end of a recent discussion about future career choices with pupils at the school, one young girl paused for thought and said, ‘A teacher’. But then she has only seen an environment where teachers are trusted, properly resourced and whose professional judgements are valued; an environment of trust operating in a culture of openness.